Cabin on the Square | Out of the Box! 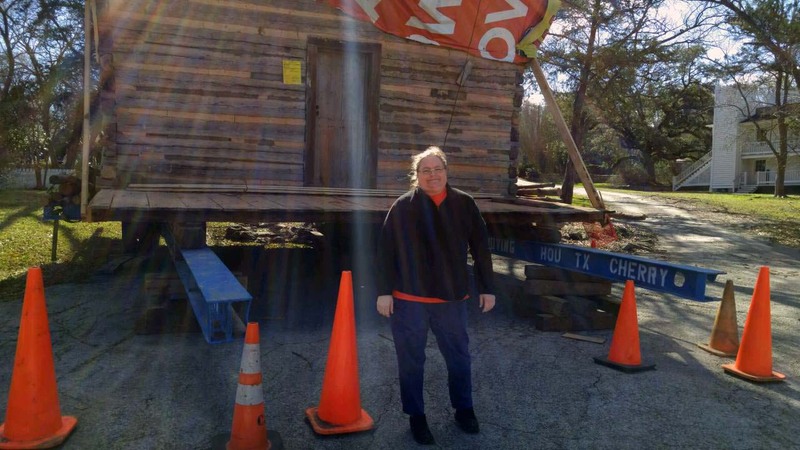 Moving History: The Roberts/Farris Cabin, Sam Houston Memorial Museum, and a few thoughts…. Standing by the Reynolds/Farris cabin on the grounds of the Sam Houston Memorial Museum. On Sunday, my daughter, granddaughter, and your SHSU University Archivist headed to the Sam Houston Memorial Museum Park to run off some of my 2-year old granddaughter’s energy. Heading up the driveway by the Steamboat House there in front of us on a trailer was the Roberts/Farris Cabin; also known as, “The Cabin on the Square.” Fighting the crazy wind blowing I immediately walked towards the cabin and realized two things: I never knew just how small the 176-year-old cabin was and how sad I felt for the little cabin. Taken apart in pieces in 2001, than put back together by history students from Sam Houston State on the square where it finally found a new home only to move again 15 years later. Thankfully, all in one piece this time. Sitting there on a trailer besides the Woodland Home, Bear Bend Cabin, and the old Exhibit Hall, the cabin just looked tired and unhappy. Not to worry little cabin, you are in BearKat country now. Here we take our motto seriously, “The Measure of a Life is It’s Service.” The people, who work at the Sam Houston Memorial Museum, know how to treat historic buildings big and small. They will have you settled in no time and once again, there will be all kinds of visitors to come visit you to ooh and awe over your simple beauty. To see more history about the Roberts/Ferris cabin come and visit the Special Collection Department in the Newton Gresham Library. 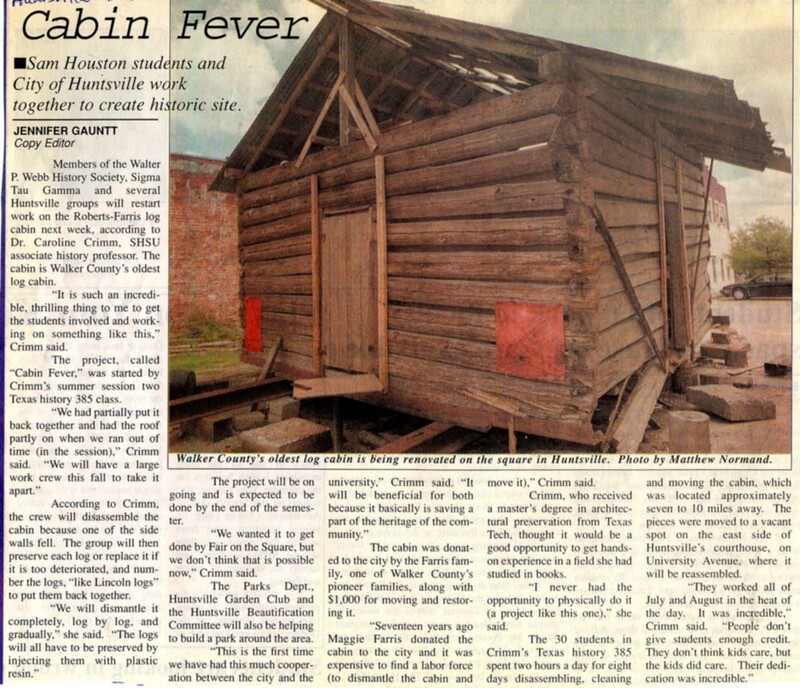 You can also read, Cabin Fever: The Roberts-Farris Cabin: A Campus, A Cabin, A Community.” A brief account of the Life and Times of the Builders and Residents of a Small Log Cabin in Walker County. This title is available at call number: F392 .W24 C75 2002.